When I was younger, a friend of mine taught me about something that spoke to the way I look at a creative medium. He said (and I paraphrase) “If you really want to understand a creators’ mind, see who influenced them.” I took this into consideration and started to research the influences of one of my favorite creators, Junji Ito. Junji Ito as a horror author was influenced by two influential creators; the cheerful easygoing Kazuo Umezu, and the strict samurai looking Hideshi Hino. 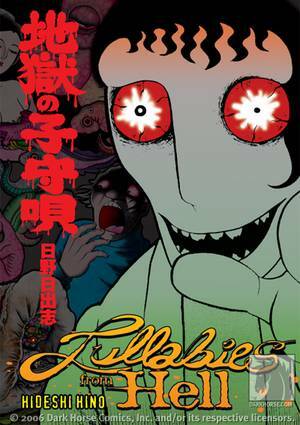 Well tonight Umezu’s fantastic catalog will have to wait, for tonight I am reviewing one of Hideshi Hino’s few in-print manga series, 2005’s Lullabies from Hell. Hideshi Hino has been working on manga for over forty years; going back to his start in Osamu Tezuka’s anthology magazine COM. Hino is known for his gore centric horror tales, many of which were based around his childhood growing up in China after World War II. A life filled with fleeing anti-Japanese-Chinese citizens permeated his life and influenced his work. While Hino has an enormous bibliography, very little of his work can be found in English (or even in print). So I guess Lullabies from Hell is your easiest choice. Lullabies from Hell is broken up into four stories: A Lullaby from Hell, Unusual Fetus, Train of Terror, and Zoroku’s Strange Disease. A Lullaby from Hell is a sort-of auto biography about Hino himself that involves him talking directly to the reader about his childhood; illustrating how he grew up to be a mangaka who lives in a house filled with animal parts in jars that satisfy Hino’s love of bizarre and terrible things. He talks about his life growing up in the same hellish neighborhood he still lives today, surrounded by factories and open sewers. Each day his dad would leave for work, leaving Hino’s mentally disturbed mother behind to torment him. Dreams of taking revenge on his mother and anyone else that would pick on him filled his head and were channeled into his drawings. 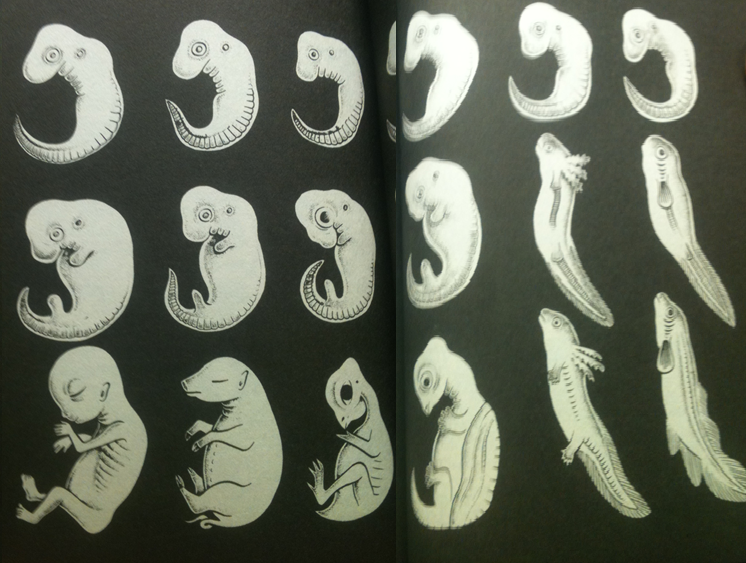 Unusual Fetus has Hino mixing Horror and Science Fiction into a story about the consequences if humans started giving birth to only animals. A different Hino self-insertion takes charge in this story, and tries to create a plot about what would happen if his pregnant wife gave birth to a monster. Their child is born not as a human, but as a half frog/ half lizard monster. Now this terrifies Hino, but his wife still considers it her child. Things start to go downhill when the baby tires of breast milk and starts to go looking for something live to eat. All the while the human birth rate starts to drop rapidly with all human pregnancies turning out to be animal births; a repercussion of man’s pollution. Train of Terror is about a boy named Shuichi’s who is returning home from visiting his grandparents. He is taking the train with his two friends, all the while wondering about the tunnel that they are about to travel through. He considers that this tunnel might transport them to a parallel universe. The lights turn off, and when they turn back on, the shadowy man who was also sitting with them disappears; leaving behind a crow feather. This is when things start to get weird for Shuichi and his friends; commencing with all the people on the train glaring at them with these menacing faces. But this is only the beginning of the weirdness that continues for the rest of the story. 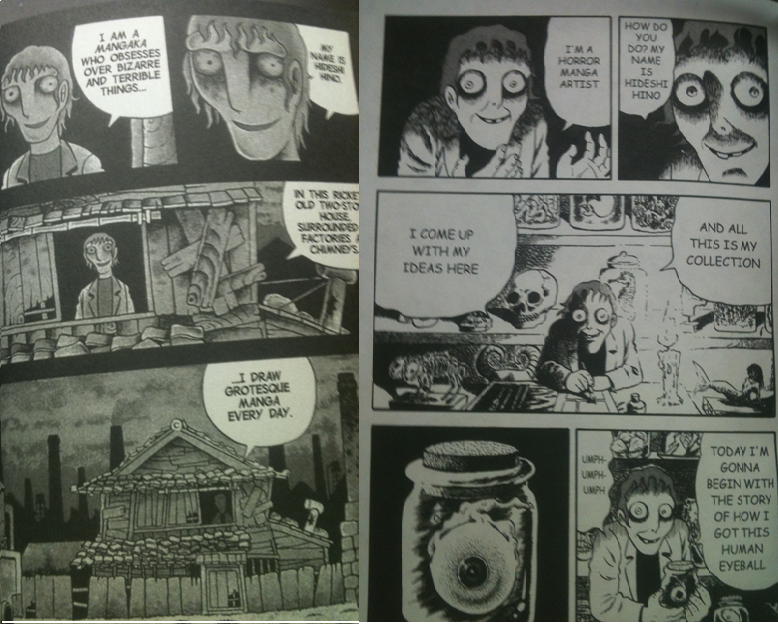 Zoroku’s Strange Disease takes place in a fictional time of old; filled with superstition, thatched huts, and farmers. Zoroku, a slow and lazy farmer who spends his days painting, is to be exiled from his village because of the Neoplasm (boils) that covers his face. His caring mother tries to convince the villagers against it, but is unsuccessful. Zoroku is sent to live in a shack inside of the Swamp of Slumber, considered by people to be a place where the forest animals come to die. The villagers made the grievous mistake of not considering just how bad Zoroku’s condition could get. When describing Hino’s art style, many would call it cartoony. I hate to use that word, personally considering its use equivalent to purposely undermining merit. But yes, Hino’s characters are known for their bug eyes and misshapen heads. I also read two of his other titles; The Red Snake (1985) and The Collection (1996) which had different designs and levels of detail, but those trademark features stayed the same. For fear of someone not picking this up, I tried not to bring up how gory Hino’s work is. He keeps most of the truly gross stuff to Lullaby from Hell, but that is just my opinion. There is a lot more going on here than just the gore. Pros: Each story is dueled with a different genre to create four completely different titles. A great modern look at what Horror manga was like in the past. Contains some fantastic imagery that plays at the printed medium, allowing for the truly shocking to entrance you. Cons: The character designs are going to be a breaking point for many people. Lullaby from Hell being at the front of the book is going to unfortunately push any non-gore fans away. It is not going to bode will with people who cannot stand certain levels of overreacting to something that is supposed to be scary. Lullabies from Hell was released by one of my favorite publishers, Dark Horse. The release looks nice with its black flyleaf and colorful cover. If you believe that horror is a genre that you would like to look into, and you do not like taking the beaten path, I suggest starting with Lullabies from Hell. For reading this manga is the only way to know that Fear itself really exists, and it goes by the name Hideshi Hino.